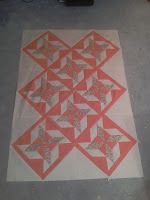 Hazel's Quilts: What's Next, and WHEN next? So I have been kept very busy by Grumpy George down at the allotment - there have been so many things to pick - courgettes, french beans, runner beans, raspberries and blackberries - that I have the freezer full to overflowing! And while I've been down there, it's been tricky to keep up with sewing, and in particular blog following - I don't mean to be antisocial, honest! 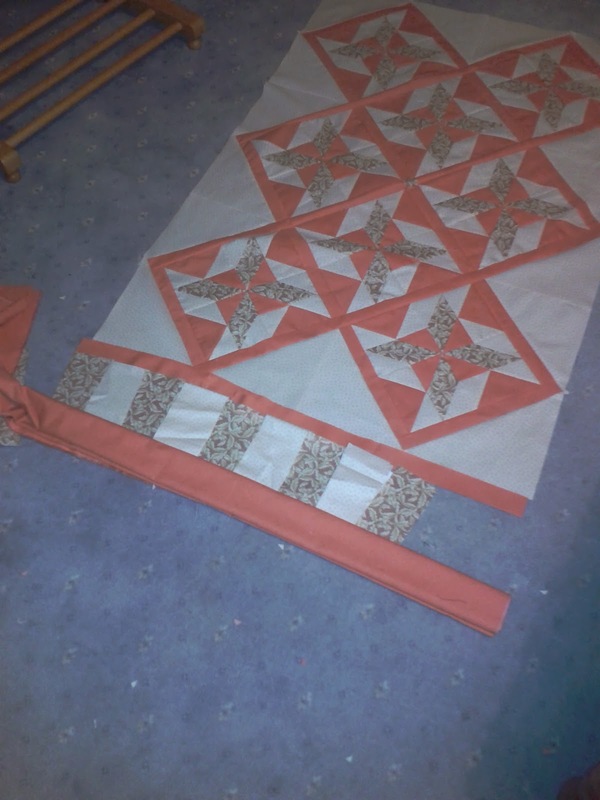 But Eleanor's Quilt is coming on well - I've been careful with the bias cuts, in particular, and the starch has become my lifelong friend! 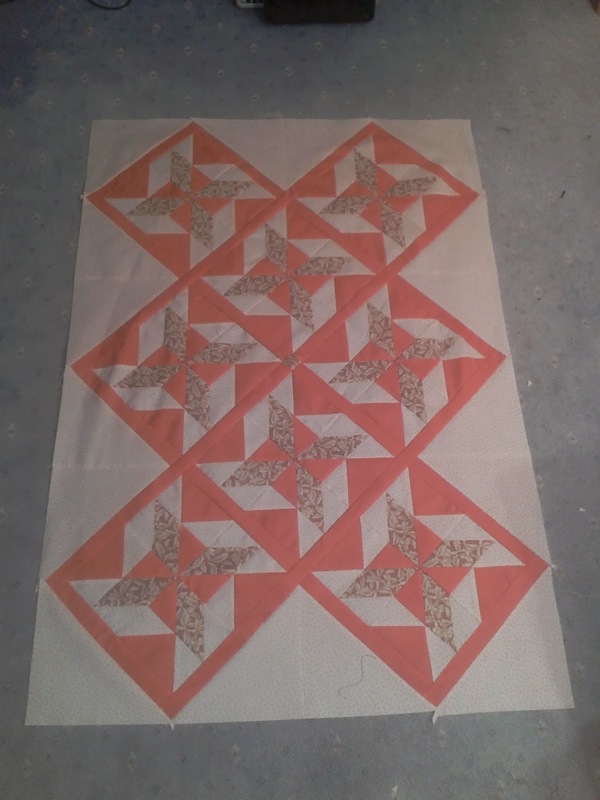 I have a decision to make now, though - because the quilt is designed for a double bed, and this is destined to go on a single bed, it mucks about with the proportions of the pattern as QuiltSue has designed - mine needs to be the same sort of length, but only 36" wide, max. Sue's kindly downsized the block instructions for me, which makes the width about where it wants to be, but I need to boost the length somewhat. I thought that I could run an orange bar across top& bottom, then a fat piano keys border of the background and the patterned fabric, and then the whole darn lot can have a 2 or 3" border, and that's about that. Does that sound like a plan? You have to use your imagination a bit with the pic! Oh - and another thing, are we running this month's Christmas QAL this coming weekend (7th/8th) as I boldly put down in my last post, or the more correct 14th/15th Sep? Let me know which you'd prefer and I'd get the nibbles in ready for the party! Eleanor's Quilt is looking great. I like the piano key border idea. My vote the the Christmas QAL is for the 7th-8th! I will be far too busy the following week, setting off on my very first cruise! I'll be away from my sewing corner on September 7 and 8 so won't be able to participate but will be there in spirit! I have a wedding the weekend of the 14/15 so the earlier weekend is fitting for me - but what is best for the group is more important. Just let us know so we can make blog post announcements for reminders. I love the piano keys idea to add length. As for the QAL, this weekend would be better for me probably, but really I will just go with the flow! 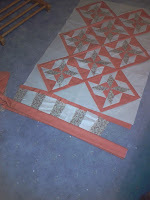 Like the idea for the quilt and can't wait to see it finished. As for the weekend, we have elections this one and I will be working on the 7th, which is one really long day, so will probably be rather tired the next day and 14/15th is our local biennial quilt show, so I'll leave it to the masses. I've done a little bit this last week, so I'll not be too far behind. Just let me know when to pull out my Christmas sewing and I'll be ready. Your quilt is looking terrific. 14/15th would fit my schedule much better.